Extruded aluminium enclosures consist of one piece of box-section aluminium for the body, with two plastic/metal end caps and a optional bezel. These enclosures are really good for small/medium PCB projects. The extruded aluminium normally has guide rails on the insides so that PCBs can slide into it. With the case being made of metal, heatsinking is easy. 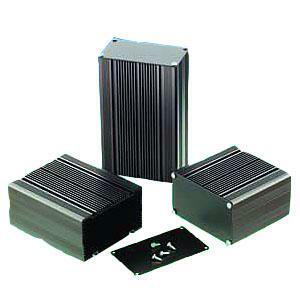 Examples of extruded aluminium enclosures by Vero Technologies. Connectors/indicators typically have to come out from either end. Right-angled PCB mount connectors are the easy to use with this configuration (panel mount can also be used). Hammond is a large manufacturer of this type of enclosure. See their page, Extruded Aluminium Enclosures (Metal End Panels) (1455 Series).